Get your first shot of REAL power with the RUSH 4 -250 PRO. 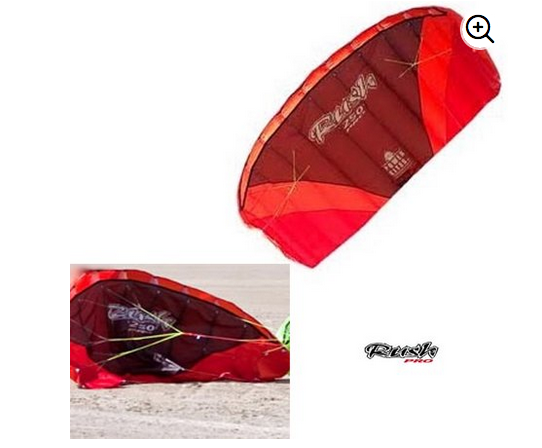 Meaner than average 2 meter kites, the RUSH 250 Pro is slightly larger. Perfect for those looking for a little more power. This 2.5 Meter size is especially good for teens and smaller adults. Those looking to mess around on skateboards, landboards, and snowboards should be lighter (approx. 150 pounds and under) on it will not pull you. It has 3 lines instead of 2 lines, like most trainer kites.The 3rd line helps easily relaunch the kite by simply pulling on the 3rd line. A terrific trainer for kiteboarding, landboarding and snowkiting. Ready to fly out of the bag! Lines: Dyneema 175 / 100 kp (385/220 lb. ), 3 x 20 m / 65 ft + Controlbar (50 cm / 20 ''), inchl.